I don't have a Paypal account, can I still order using your online ordering system? Do you accept other forms of payment besides Paypal? What is the expected delivery time for my order? Can I upgrade the shipping on my tubes to faster delivery? I live outside of the continental U.S. can I still buy from carbonfibertubeshop.com? Do you sell to dealers for resale? I want to order bulk tubing can I get better pricing? One of your tubes broke, can I get a replacement sent out at no charge? Why buy from us instead of building your own tubing? What is so great about carbon fiber tubing? What materials are used to build your tubes? How much heat will these tubes withstand? Can carbon fiber tubing be bent to shape like metal? What are those funny lines on the tubes? Some of your tubes don't look like the carbon fiber I've seen, why is that? Will carbonfibertubeshop donate/sponsor tubing for non-profit organizations? Where are these tubes made? Will your tubing work for my application? How do these tubes withstand weather? What precautions should I take when cutting carbon fiber myself? Do you sell carbon fiber plates? Do you sell curved tubing? Do you sell tubing in different colors? I need some custom tubes built to my specifications, can you build them for me? Does carbonfibertubeshop cut or machine tubing? Yes, you do not need to have a Paypal account to use our shopping cart. We use Paypal for most of our payments but all you really need to use our online ordering system is a credit card. Yes, you can call us with any major credit card to order at 801-471-4150. You also have the option of mailing us a check or money order to order tubing CFTS. Orders paid for with money order will ship when we receive the payment. Order paid for with a personal check usually don't ship for 5-7 days after the check clears our account. We also accept fax in orders, click on the link below if you wish to fax your order. What is the expected delivery time and shipping cost for my order? *Partial shipping refunds "may" be automatically given for some small and medium tube orders. 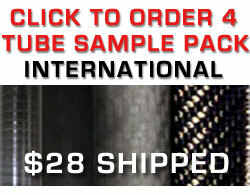 Due to the length of some of our small tubes the shipping costs can be relatively high. We offer refunds when and if our shipping costs are out of line with what it costs us to get the tube to you. Our goal is to cover our shpping and handling costs while providing a speed and secure delivery to our customers. Can I upgrade the shipping on my tubes for faster delivery? Yes, please email us before ordering and we can let you know the cost of upgrading and how quickly we can deliver your tube. 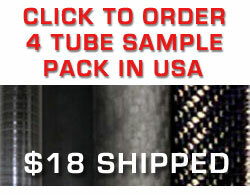 Yes, please email us with the tubes you need and your shipping address and we will quote you a price and delivery time. If you wish to return your tube(s) we have no problem accepting them back. You shouldn't have to pay for tubing that won't work for your application or if the tubing is the wrong size for your application. All returns must have an RMA number written on the outside of the box or we cannot accept them. Please call or email for an RMA number. All returns are subject to a 15% restocking charge and we do not refund the shipping and handling charges. The only exception to the restocking fee is if your tubing is damaged during shipping. We insure all of our shipments. To return tubing damaged during shipping we will require photos of the shipping box and broken tubing. You can email us digital photos or mail us pictures. If the box looks badly abused and or the tubing is obviously broken inside the box do not accept the shipment. Instead refuse the tubing and let the courier know you are refusing the shipment because it has been abused. This will keep you from having to go through the process of shipping everything back yourself and it helps us prove our case with the shipping company. When you accept a shipment most shipping companies see that as your confirmation that the shipment is in acceptable condition. If you do accept the tubing and it is damaged please contact us right away. We will get new tubing shipped out to you as soon as possible. We want your experience to be happy and will do what it takes to resolve problems that may occur. One of my tubes broke, can I get a replacement sent out at no charge? No, we do not offer guarantees on broken tubes if you break them. There are many variables that affect how much load a given tube will withstand. While it is possible to build tubes with the same quality as our tubing but it will not be cheap. This involves a lot of specialized equipment and materials. The main hurdle to building tubing like this at home or in low numbers is experience. Our tubing line-up has nearly 20 years of experience behind it. This is the main reason we exist, so that you don't have to buy all of the equipment and spend lots of time working out the process. Our high performance tubing is an easy way to get what you need and get it quickly. The main benefits of carbon fiber over typically used metal tubing are its low density (weight) and high stiffness. These are great reasons to utilize carbon fiber tubing but there are some benefits as well. Carbon fiber tubing has a very low CTE (coefficient of thermal expansion) which means when heated or cooled the material does not grow or shrink much at all. The CTE of carbon fiber is very near zero. This is great for optical or precision movement applications. Another benefit to carbon fiber is that it does not transfer heat as much as most metals. One of the biggest benefits of using composite tubing in general is the ability of the material to resist weather much better than metals because it will not corrode. Carbon fiber tubing can be tailored much more to a given application with regard to directional stiffness and strength. With metals you can change alloys, diameter and wall thickness to accommodate the application but with carbon fiber you can specify the material stiffness, diameter, wall thickness and layup. Changing the layup or winding schedule in filament wound tubing can increase strength and stiffness only where needed without having the added weight. For example if you want a tube to become resistant to crush or as a pressure vessel you would wind or wrap the filaments around the diameter of the tube to hold the pressure in but you may not place any fibers running down the length of the tube if there will be no bending force. This can be changed to accommodate mostly bending loads as with our tubing as well. Carbon fiber is a super material! Our tubes are made from standard modulus (17 MSI) uni-directional carbon fiber prepreg. We use a thermoset epoxy to complete the matrix. All of our material is stored at precise (low) temperatures to maintain its properties. We use prepreg instead of dry fabric because the stiffness to weight ratio is relatively high. Wet layups aren't the best way to go when you're going for ultimate performance. Carbon fibers by themselves can withstand very high temperatures but when used in an epoxy resin matrix the laminate is limited in its ability to withstand heat. The mechanical properties of all materials begin to change when exposed to heat or cold. Sometimes this change is severe and sometimes the change is barely noticeable. The material we use to fabricate our tubing is designed to be used at temperatures less than 215F. This does not mean the tube will fail at temperatures greater than 215F. It does however mean that the tubing will begin to lose strength and stiffness beyond this temperature. You may not see any visual change in the material until you reach 350-400 degrees Fahrenheit. At that temperature the tubing will begin to break down and may turn ashen in color. As an aside there are specialized resins that can be used at elevated temperatures. Even with specialized resins 400F is pushing the limit. You may be aware of carbon fiber clutch or brake disks being used in race cars which would see temperatures well beyond 400F. In this case a carbon fiber/resin laminate is created and then undergoes a coating/curing process in which the part is super-heated to burn out the resin. Once the resin is burned out it is replaced with a liquid silicon based compound and cured again to become a silicon carbide laminate. No Way! Our carbon fiber tubing is built using a thermoset epoxy resin. This means that once cured the epoxy never returns to a liquid state. If you tried to bend our tubing it would break with enough applied force but it will not bend. Carbon fiber/epoxy composite is very stiff! There are resins out there under the classification of thermoplastics that can be heated and formed over and over but we do not use thermoplastic resins ever. Those are cello lines that leave a very small imprint in the top layer of resin. These lines are there because of the manufacturing process these tubes go through. Lines are evidence of the extreme pressures these tubes are cured under. Lines are good! These lines can be sanded smooth by removing a few thousandths of an inch from the outer diameter. After sanding the tubes may be clear coated to return the shine. If you are used to seeing carbon fiber as a woven fabric with a pattern these tubes may look a little foreign to you but trust us, uni-directional gives a much better strength to weight ratio when compared to woven fabrics. Uni-directional fibers are laid up in a single direction but layers can be rotated to give strength in any direction without the added weight and weakness of a woven fabric. Fabric is used in molded parts for many reasons not the least of which it is easier to form into a complex mold. With tubes we don't need to use it. All of our large tubes do have an outer layer of cosmetic fabric specifically to achieve that pattern look but underneath that top layer they are all uni. Uni-directional carbon is often used by the aerospace industry due to its performance. No way, we're cheap! Kidding of course, we offer a 10% discount for recognized educational organizations. In the beginning we had many requests for full sponsorships in various projects ranging from FSAE to aero programs so instead of helping a few schools per year with a full sponsorship we help dozens per year by a small amount. Ultra Carbon Fiber has been in business since February of 2004. All of these tubes are made right here in the U.S.A.
One of the benefits of using carbon fiber tubing is that it will withstand weather better than most other materials. Moisture and temperature does not faze carbon composite tubing. Weathering does not phase it but ultra violet radiation will degrade the epoxy and weaken the structure if it is not coated properly. To fully protect the tubing it is advisable to paint any portion of the tubing to be exposed to UV rays for long periods of time. Even when left outside in a very high index UV area of the country you would not notice any significant changes for many months. As the UV light degrades the epoxy the tube may become slightly more golden in color and may look faded. We have tested the effects of sunlight to a great extent so we know what we're talking about. If you want to maintain the look of the carbon fiber just use a clear coat paint with UV inhibitors. We do not paint single tubes but any qualified paint shop could handle the task. There are also companies that manufacture a clear spray on protectant to inhibit UV radiation, the only downside to these coatings is they need to be applied every 4-8 weeks depending on exposure. One such company is www.303products.com They may even be able to help you with a free sample. carbonfibertubeshop has no affiliation with 303 Products. No website is complete without the legal disclaimer so here we go. carbonfibertubeshop.com (Ultra Carbon Fiber) makes no implied guarantees as to the fitness of its tubes nor do we guarantee they will work for your application. Since there are so many different possible applications and loading scenarios we cannot possibly sell a tube that will work for all situations. The customer will be responsible for any and all calculations of material fitness. In some applications life and limb may depend on these calculations and a given safety factor. We HIGHLY recommend you check with a qualified engineer before subjecting anyone to a potentially dangerous situation. Testing of material fitness is the sole responsibility of the custom. The material properties for a given material are estimates only. All bonding procedures listed on this site are for demonstration purposes only, therefore the customer must be responsible to make sure correct steps are taken to create a reliable bond. We (UCF) will not be responsible for any injury incurred through the use of power tools while working with our tubing. Always wear eye and airway protection when cutting our tubing. Follow all instructions that came with your tools before using them. Any damage to property or human life through the use of our tubing is the sole responsibility of the customer. Cutting carbon fiber safely requires the same protection you would expect to use when cutting anything fibrous. First of all you need to protect your lungs from the tiny fibers that may be disbursed into the air you must wear a painters dust mask over your nose and mouth. If you are doing a lot of cutting all masks should be stored somewhere other than the cutting area when not in use. This ensures that the inside of the mask is kept free of falling particles. When you see the outside of the mask start to become discolored it is a good idea to switch to a new mask. The next safety device you will need is a pair of safety glasses. The type that fully covers the front and sides would be the best option. Safety glasses will prevent any flying debris from damaging your eyes. Goggle type safety glasses will keep the finer particles (dust) away from your eyes as well. Another area you want to protect is your skin. Carbon fiber/epoxy composite is not harmful to the human body but the dust particles are very small and stiff and can irritate your skin just like fiberglass. This is not something to be overly concerned about but the risk of irritation is there. You can take measures such as latex gloves and/or cutting sleeves to minimize the risk. Carbon fiber is a relatively safe material to work with when some common sense is applied. You can see photos of these safety items on the cut & bond page. We build carbon fiber tube assemblies that slip together to create one long tube by way of internal or external tube ferrules. Typically one side of the ferrule is bonded while the other side of the ferrule is a slip fit connection. Many customers use these assemblies as camera booms to take amazing overhead shots. Our custom tube assemblies will save you thousands of dollars over buying a pre-built camera boom system. See examples of our work here. Yes we do. All plate is vacuum infused and we would be happy to quote plates made from several different materials and finishes. We guarantee this is the most beautiful plate you have ever seen. We will be adding a page to the site shortly, until then please email us for a quote at sales@carbonfibertubeshop.com If you are looking for custom plates we can handle that as well including custom water jet cutting. One of our recent customers is defense contractor, General Dynamics. No, all of our products are shown here on our website. As we expand our product line we may produce a catalog. No, graphite is always black. If you have seen colored carbon fiber somewhere it is either Kevlar, coated fiberglass, or a carbon Kevlar/carbon-glass mix. We do not feel the demand exists to justify the added cost of purchasing custom runs of prepreg fiber from our material supplier. Dry fiber is much easier and cheaper to source in colors but prepreg is a different story. I need some custom tubes built to my specifications, can you quote them for me? Where we differ from other shops is that we do not have a minimum quantity or set amount you need to purchase for custom orders. Need 1 tube or 100 and we can handle it! Please note that if your application requires advanced engineering consulting we have several engineers that would be happy to assist you. However, engineering support is not a free service and will be charged hourly. We pledge to do our best to provide you with general technical information about our products in a timely manner. We do not machine tubing but we will cut your tubing for $5 for the first cut and $1.50 for every cut after that, up to 10 cuts. Beyond 10 cuts please email us for a custom quote. Contact us before ordering so that we can send you a Paypal invoice for the correct amount including cuts. Does carbonfibertubeshop offer tube bonding? Yes, we offer tube bonding services at a rate of $45 for the first bond and $10 for every bond after that. Volume bonding quoted on a custom basis. Please contact us before ordering so that we can discuss your requirements. We listened to what our customers wanted and this is our response. In our sample pack you will get four sections of carbon tubing between sized from .500" ID and 1.00" ID and at least three inches long. Each section has a different outlook so that you can make an informed decision with regard to the visual appearance of our tubes before buying a full length tube. The 4 outlooks are uni-cello, uni-sanded, fabric cello, and fabric sanded. No guarantees are made with regard to sizing other than each tube will be sized within a range of .500" ID and 1.00" ID. If you email us before you order we may be able to make sizing substitutions depending on our current stock of remnants. We do not cut down full length tubes to provide samples but we make every effort to accommodate our customers. Please note we DO NOT offer free samples of our tubing due to the high cost of the materials involved and the number of requests we receive for samples. When it comes to most projects $18 ($28 for international orders) is a small price to pay to make the right decision.